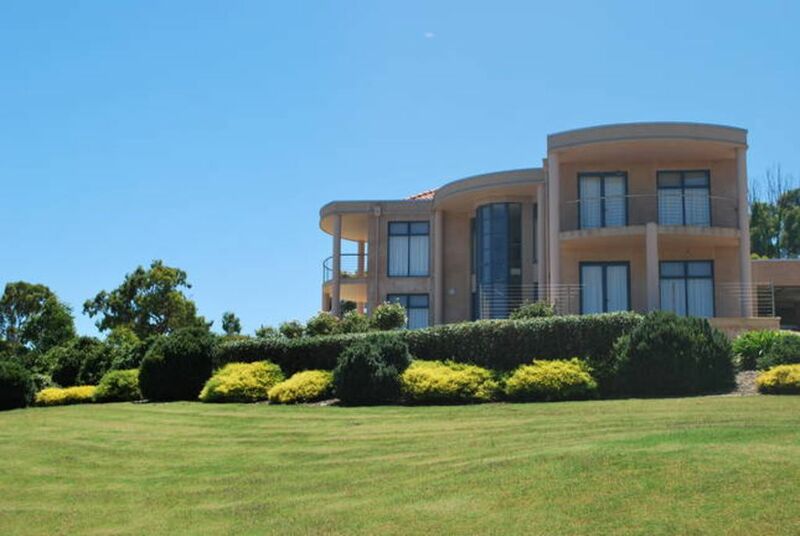 With spectacular coastal views and stunning sunsets, Normanville's most luxurious holiday home sits proudly on the hill above the charming Fleurieu Peninsula township and can be enjoyed all year round. Set on 5000 square metres of landscaped gardens, this modern home provides the ultimate in holiday accommodation. With a tennis court and 15 metre long infinity pool the options are endless for either the energetic or for those that just want to relax and soak up the stunning environment, the remarkable sunsets and fresh sea breezes. The house features 5 bedrooms and three bathrooms (complete with bidets) and is the perfect size for couples and families who want to get away and share a holiday together. Shops, galleries and cafes are just a 5 minute walk away and you can drive to the beach or to the award winning Links Lady Bay golf course in a matter of minutes. The white sandy beaches of Normanville are perfect for sandcastles, swimming, snorkelling and fishing or for that lazy walk. The golf course, currently ranked 49 in the 2014 Australian Golf Digest top 100, can be a challenging test for the advanced golfer whilst still providing a fun game for the beginner. You may have to share the fairways with the local kangaroos! Local fishing charters, horse riding, winery tours are all on offer in this idyllic location. IF YOU ARE INTERESTED IN MAKING A RESERVATION FOR THIS PROPERTY PLEASE MAKE CONTACT WITH THE OWNER/PROPERTY MANAGER BEFORE TRANSFERING ANY FUNDS VIA THE STAYZ WEBSITE. BY MAKING AN ENQUIRY YOU WILL ALERT THE PROPERTY OWNER/AMANAGER TO YOUR INTEREST IN THE PROPERTY AND FURTHER DETAILS WILL BE PROVIDED TO YOU DIRECTLY. A $150 LINEN AND CLEANING FEE IS APPLIED TO SINGLE NIGHT BOOKINGS. THIS IS NOT CHARGED FOR BOOKINGS OF TWO OR MORE NIGHTS. Sunset retreat has five bedrooms and three luxurious bathrooms, 4 upstairs (one king, one queen, one double and one twin single) and one downstairs (double). There is a bathroom downstairs, a central bathroom upstairs and an ensuite to the main (king) bedroom. The home comfortably sleeps 10 but can extend to 12 by using the sofa bed in the lounge room downstairs. Quality linen is supplied including sheets and bath towels. Guests bring their own beach towels. The two living rooms each have 42'plasma TVs as do each of the bedrooms. There are 4 DVD players and a large selection of movies to watch. The kitchen has quality appliances, stainless steel fridge, stone benchtops and all of the right cooking accessories. Outside is a large gas barbeque. The well appointed laundry has a Miele washing machine and dryer and a large underbench clothes basket. There is ducted reverse-cycle airconditioning to keep you cool in the summer and warm in the winter. There is so much to enjoy while holidaying at Normanville : water sports, fishing, golfing, horse riding, arts and crafts, great coffee shops, fine food and some great local wines to discover. Try your hand at beach fishing or drop a line off the local jetty. The former whaling port of Victor Harbor is a short drive away through the picturesque Inman Valley and the famous McLaren Vale wine region is only 20 minutes away. The Deep Creek Conservation Park is a 15 minute drive away. There are many walking trails of varying distances and suitable for walkers of all abilities. You will be rewarded with uninterrupted views across to Kangaroo Island, hidden beaches, waterfalls, and interesting flora and fauna. There are many good spots for a picnic lunch. Rated South Australias number 1 resort course and modelled on the traditional links style courses of Ireland and Scotland, the Links Lady Bay Golf Course will provide you with the definitive golfing experience. With beautiful views over the hills and coastline, the Club has excellent bar and casual meal facilities and a fine dining restaurant. A shuttle-bus can also be arranged to pick you up from Sunset Retreat and drop you back so you can enjoy a cold beer or two or a glass of wine from this renowned wine producing area. There are also 4 other quality golf courses within 20-30 minutes drive. The Victor Harbor Golf Club, Mc Craken Golf Club, Fleurieu Golf Club, Wirrina Golf Club are all accessible and provide a wonderful golfing challenge. Normanville is has an abundance of great food options. Jetty and its companion store Six Acre Grocer, both in the main street, have fantastic locally sourced fresh food available. The grocery store stocks a wide range of fruit, vegetables, cheeses, olives and condiments. You can buy fresh kangaroo island oysters and fish from Jetty and there are many eat-in and takeaway food options. Just along from Jetty is Normanville's newest eatery, Little Sister. Ben Johnson formerly of Duthy Street Deli, Queen Street Deli, and Bistro Dom, is serving great food and coffee. Further along the street, the Court House cafe and restaurant is another great choice, especially for a special dinner. Coffee is great in all of these outlets. The views from the Peninsula restaurant at the Links Lady Bay Golf Club are fantastic and the food is good too. A little further afield, the restaurant at the old mill in Second Valley, A Sense of Place, is outstanding. The pies and pasties from the Yankalilla bakery are the best in South Australia. Quality home with stunning views! This is the second time we have stayed and have really enjoyed both our trips. The house has plenty of room for a big family and feels like a quality home. We struggled to get the home cool on the 40 + days and contacted Julie who was great and told us to buy some fans on her account at the local hardware store. The house obviously comes at a premium price and I think that things like the bbq should be working without the use of matches and furniture should reflect that premium price (outdoor chairs feel pretty cheap). All in all we had a great time and the pool is awesome. This property was beautiful & clean, really spacious and so relaxing on a really hot weekend overlooking the beach. Couldnt have asked for a better weekend getaway! Amazing view and very spacious house with all you need for a perfect getaway!! We enjoyed our stay. Julie was very informative with house rules- house was clean and large perfect for our big family! BBQ and outdoor seating outside perfect for meals outside with magnificent views. An amazing place to stay. This property has everything. From mesmerising views, chilling by the pool or just enjoying a relaxing time away. Strongly recommend for family and friends. The property agent provides wonderful corispondance with all the information you need to make a perfect get away. It was so good we are looking to visit again!